Thirty pack of dry erase pockets in assorted colors for use in your classroom, home or office. You get five of each color: red, orange, yellow, green, blue and purple. Each dry erase pocket is oversized to allow you to easily slip in a standard sized piece of paper. Just write on them with a dry erase marker and wipe away when done. Use them to complement a lesson plan on your white board or pocket chart. • Dimensions: 10" wide x 13.5" tall. • Made from durable plastic with non-woven fabric for long lasting use. • One grommet at the top allow you to hang it from most hooks or attach it to something. Hooks are not included. • Just write and then wipe. For use with dry erase marker (not included). Do not use permanent markers. • You get 5 of each color: red, orange, yellow, green, blue and purple. Essex Wares is a small business committed to providing you with high quality products to enhance your everyday life. We design and customize each of our products to maximize functionality while proving a stylish look. We'd love to hear from you if you have any questions about our products. EASY TO USE: Oversized (10" X 13.5") to allow you to easily slip in an 8.5" X 11" sheet of paper. Write on the outside with a dry erase marker and easily wipe away when done. SAVES PAPER - No need to keep on printing the same pages over and over again. Just slip them in once and reuse multiple times. MULTIPLE USES - Utilize for classroom lessons, storing documents or for shop tickets. Grommet at top allows you to hang up or attach to something. Six different colors allows for more creative uses. 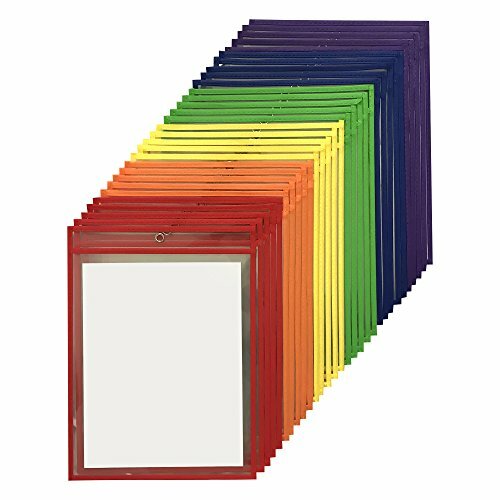 LARGE QUANTITY 30 PACK - You get 30 dry erase pockets so you should have enough to meet the needs of your entire classroom or business. INCLUDED WITH PURCHASE: 30 dry erase pocket pockets - 5 of each color: red, orange, yellow, green, blue & purple. Markers and work sheets are not included. If you have any questions about this product by Essex Wares, contact us by completing and submitting the form below. If you are looking for a specif part number, please include it with your message.